Hi friends, it’s Iris again! As some of you may know, I love music. And others may know me as “nerdy science girl.” So, what is it that I do as a student, a musician, and a scientist? Let’s take a walk through a typical day in my life at Swarthmore from last Spring. 7:50 AM. Wake up. The sun is shining its lovely golden rays, but it’s way too cozy in my bed. I’ll snooze my alarm for the next ten minutes and then get up and walk from my dorm room in Palmer (one of the Ps in PPR!) through the brisk air to the Science Center. Though most people think of PPR as “off-campus,” the walk is a very similar distance to the center of campus as it would be from Mertz (my freshman-year dorm) or Alice Paul/David Kemp. 9:15 AM. Arrive in the Science Center and get tea from the Coffee Bar. I usually pick up the New York Times, start on the crossword, and talk with my friends while waiting for my Biochem lecture to begin. 10:25 AM. Go to Cornell Library to work on a problem set for Biochem. On some days I take a small break to finish the crossword, and then other times (especially if I decide to go to Underhill Library instead), my music friends persuade me to take quizzes like: name-that-classical-piece. I’ll always bump into some of my friends in Cornell or Underhill, because the libraries are the places to go after class. Twice a week, I also work at the Cornell circulation desk, so chances are you’ve seen me around! My friends Karl, Allison, and Michelle who I could count on to be in Cornell at any day of the week — for us, it’s like our second home. 11:30 AM. Stat lecture with Prof Steve Wang! He is funny and helpful, makes statistics engaging even for the non-science-oriented, and brings in lots of relevant analogies, videos, and even props (i.e. my class saw him in a chef hat) to explain how statistics work in the real world. I really hope to take another class with Steve because he’s such a great teacher. Afterwards, I’ll talk to one of the singers in my class about which days to rehearse together for our upcoming spring recital! 12:25 PM. Dash to Essie Mae’s for a bag lunch from Grab N Go. 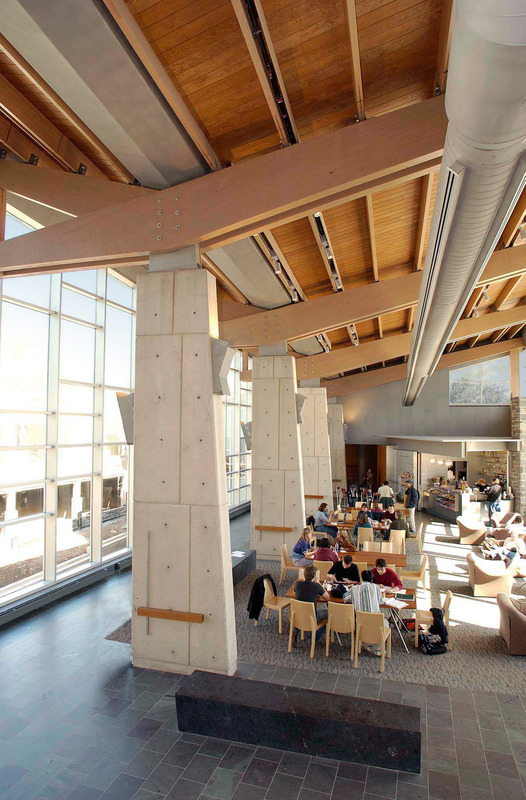 I usually bring my lunch back to the Science Center Commons because the architecture brings in a lot of light into the common area (plus, my friends are there!). On rare days if we’re lucky, my friends and I will head outside the Science Center to play with the snow because we’re secretly five-year-olds…and snow is so pretty! 1:10 PM. Whew, making it in time for Microbiology lab. Today, we’re preparing to start our 6-week individual investigation on an unknown strain of bacteria. By the end of the six weeks, we’ll have performed multiple metabolic tests and figured out the identity of our previously unknown bacteria! 4:45 PM. Go to Lang Music Building and practice piano for my private lesson tomorrow with my teacher, Tony Barone. Tony is not only a prominent pianist in the music world, but I have also studied piano with him since 7th grade at his Conservatory! He was one of the first people to introduce me to Swarthmore, and I was inspired to apply here because of his wise ways of teaching. I take lessons through the Music 48 program, which provides a subsidy — in some cases, the full cost of lessons — and the Music Department gives academic credit as well. In addition, the practice rooms are open to anyone (unlike at many other universities which only allow music majors, or require you to schedule your time on sign-up sheets) and they’re equipped with high-quality Steinways/Yamahas! Many music groups and instrumentalists/vocalists use these rooms to rehearse. 6:05 PM. Relax and have dinner at Sharples, our only dining hall. I love being able to find everyone I know in one dining hall because this means that there is no shortage of finding friends to have meals with! The ice cream is also readily available for all you sweet tooths out there. 7:00 PM. Alchemist for Orgo I. Before you say anything, no, I am not a real alchemist in the turn-metal-into-gold sense, but I am a Chemistry Department “Alchemist,” which means that I help lead study workshops for students looking for help in organic chemistry. The many hexagons (aka benzene rings) involved in organic mechanisms. 9:30 PM. Read a few journal articles for my summer research project on sea anemones with Professor Liz Vallen! We study how the protein interactions in the mesoglea are altered during the onset of symbiosis. 11:47 PM. It’s getting late at night, but that doesn’t mean the fun stops yet! We rehearsed a special four-part rendition of “Happy Birthday” arranged by Paolo and sang to our dear friend Andrew before it hit midnight for his 20th birthday! And now, a little past 1 AM, I wish you all good night — hopefully, reading this has given you a glimpse into the lives of Swatties who enjoy music & science! Birthday kid getting a backwards hug in one of the Lang practice rooms.